Honeys, I have loved a good party since I was knee-high to a grasshopper, and it only continued as gatherings of food and friends populated so much of my life. By the time I was fourteen and given the assignment of visualizing my life 10 years in the future, one of my goals was to become the consummate hostess. It’s really no wonder that I became a chef to make that former dream a total reality! Anyhow, when I was a little girl, there were two delicious salads that my mother would make that always signaled 1) It’s summer! and 2) We’re going to or throwing a PARTY! 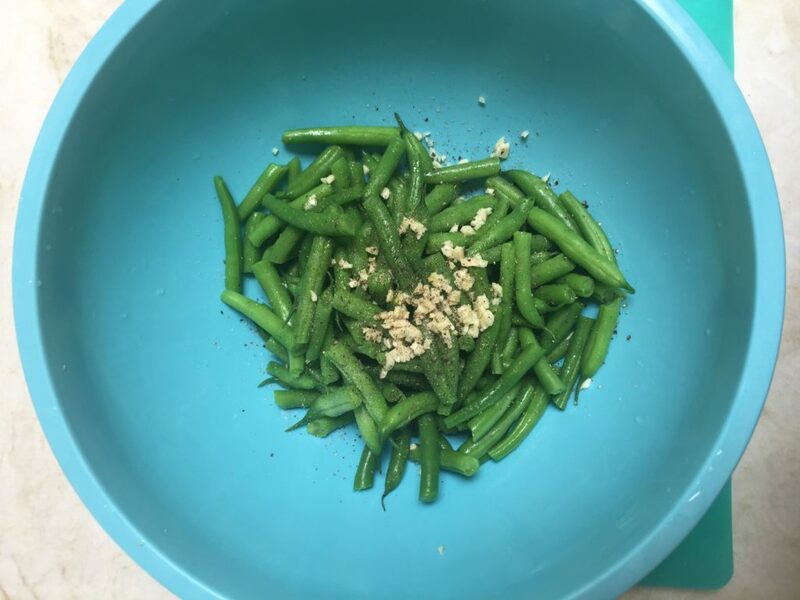 One was her signature potato salad, and the other was this ridiculously simple green bean salad. The only twist I have put on this recipe that I learned what seems like a zillion years ago is exchanging the more traditional cooking oils with MCT oil. I like the jolt of energy and boost into ketosis that it offers! You can read more about the benefits of MCT oil in my last post here. Is super low carb and keto-friendly, no matter what oil you use! 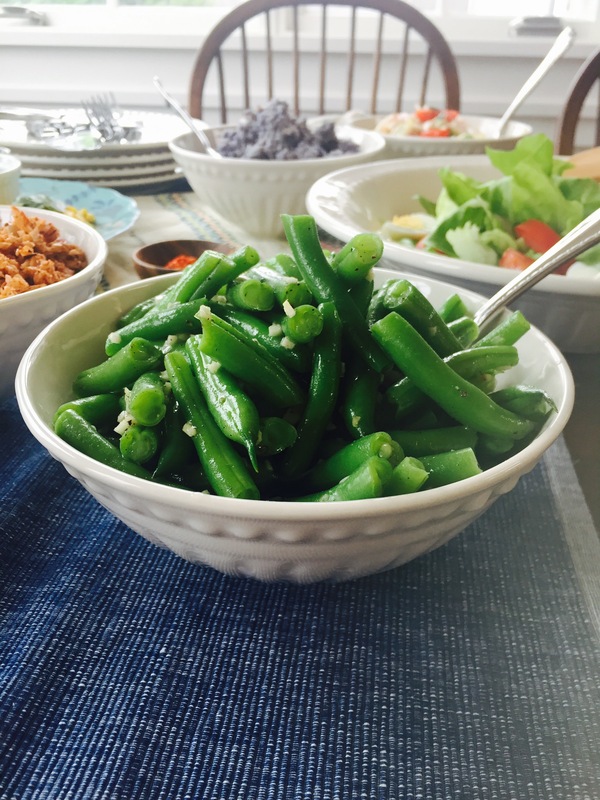 Once you try this simple salad, you are going to SEEK OUT green beans every chance you can to make it over and over again! Enjoy it at its most basic deliciousness, or add any combination of the optional ingredients to give it a flavor/texture boost. Bring 2 quarts/~1.9 liters of water to the boil with a pinch of salt added. Trim the ends off of the beans and snap into bite-sized pieces. Transfer to the boiling water and cook for 1 minute and 30 seconds. Immediately strain and shock in an ice bath of 50% cold water and 50% ice. 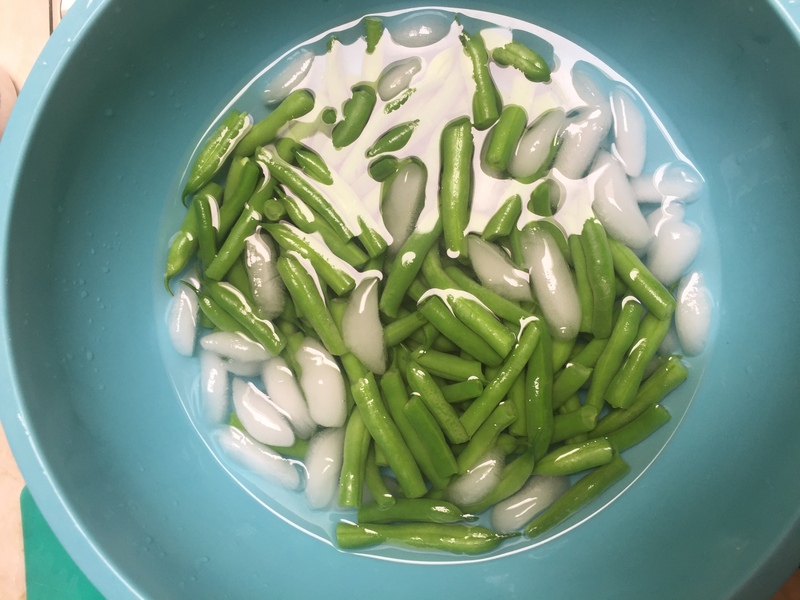 By the time the ice melts, the beans will be ready to drain. Drain thoroughly so that they are almost dry. Finely mince 2 – 3 cloves of garlic, to your taste. 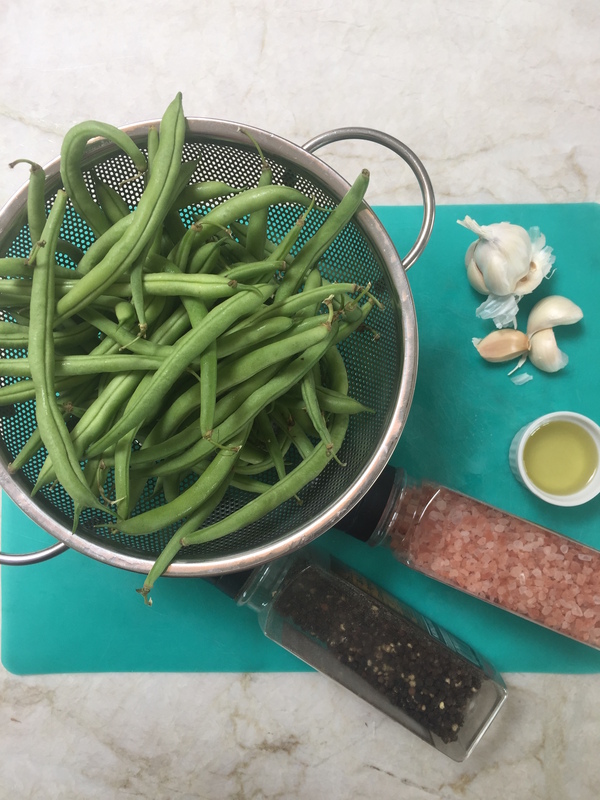 Transfer the beans to a mixing bowl and add the garlic, oil, and salt & pepper. Toss and season additionally to taste. Top with any or all of the optional ingredients if desired and enjoy! 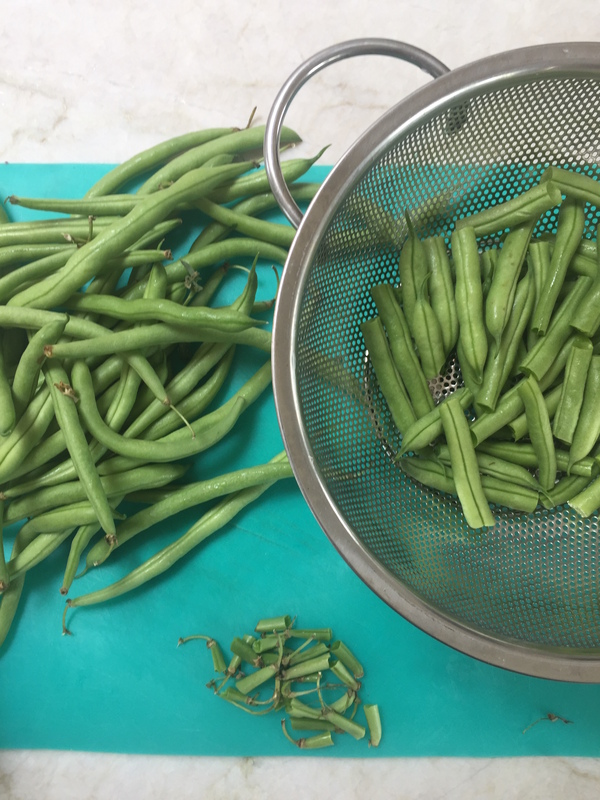 Trim and snap beans into bite-sized pieces. 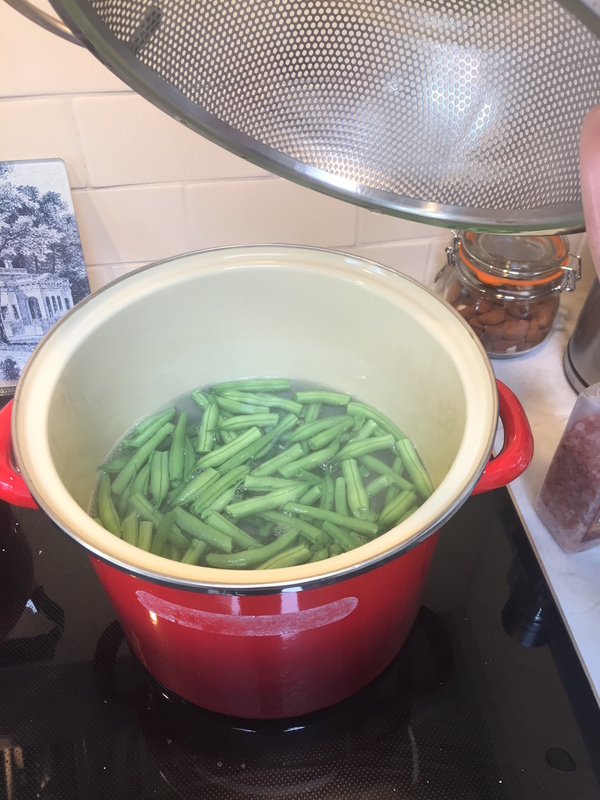 Blanch the beans in salted boiling water for 1 minute and 30 seconds. Drain the beans and shock in an ice bath. 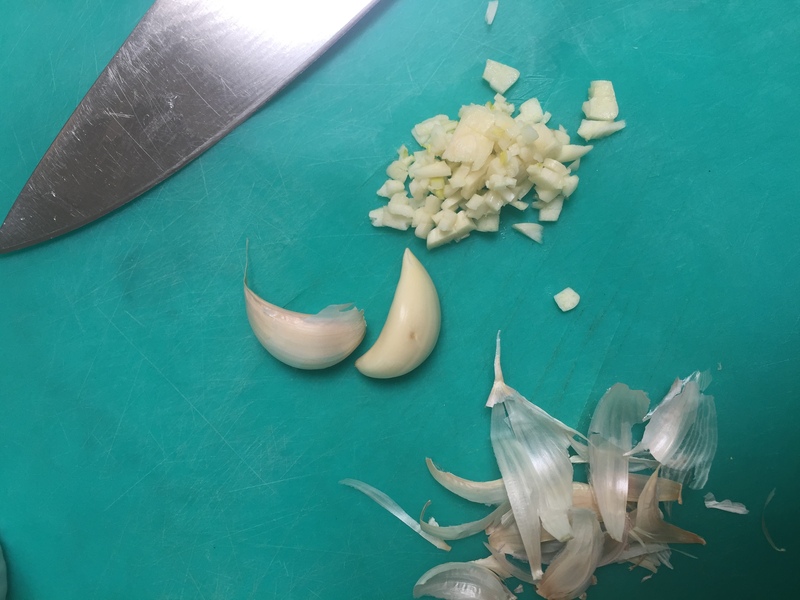 Mince 2 – 3 cloves of garlic finely. YUM! 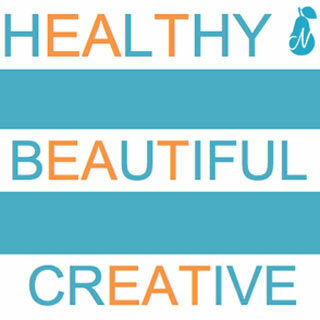 Tell me some of your favorite summer ingredients in the comments, and I will try to design a recipe just for YOU!